In May 2017, Google in its I/O announced first-class support for Kotlin on Android, a statically typed programming language that runs on the Java Virtual Machine (JVM). Companies like Pinterest, Trello, Kickstarter, and Google have already started implementing this modern JVM language. In the Stack Overflow Developer Survey 2018, Kotlin was ranked as second on the list of the most loved programming languages. 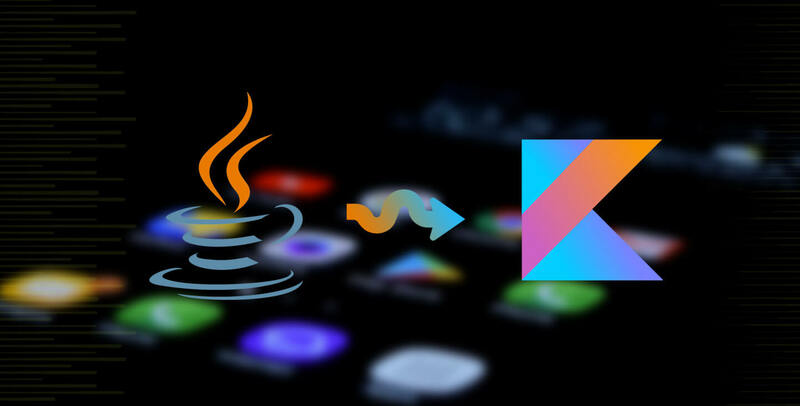 Known as the primary alternative to Java, Kotlin - built by JetBrains team based in Russia, (also developed JetBrains IntelliJ Java IDE on which Google's Android Studio is based on). 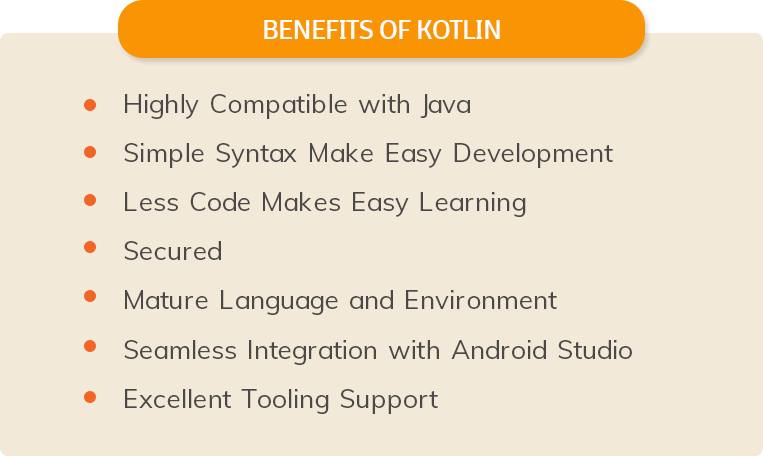 Kotline is 100% interoperable with Java, having lots of similarities in the structuring and functionalities. Kotlin - the modern and powerful language having a clean syntax, designed to solve similar issues like java (source code verbosity and runtime exception). Like Java, this is also Object-oriented and statically typed. Being a concise language, Kotlin drastically reduces the boilerplate code required, enhancing productivity and reducing error. In other terms, the code generated is more reliable and safe to use. Kotlin is designed on the concept of fail-fast. Apart from increasing the development time, this also facilitates bugs search and even preventing their occurrence in the first place, hugely reducing the cost and effort expected to fix errors. The Android App Development done using Kotlin has fewer lines of code, ultimately along with saving development time, the maintenance and effort are also shrunk. As per RebelLab Survey, where more than 2000 java developers participated and blissfully applauded the Kotlin technology announcement. The coder's choice of code makes Kotlin favorite among the developers. Moreover, combined with Google's official support, Kotlin provide ease of use. Considering the business point of view - In order to enhance the Android app's stability, weeding out bugs and checking crashes comes as the priority, which in turn establishes a better user experience on the other hand. With the myriad benefit offered (like- mass adoption, enhanced user experience, Concise) by Kotlin Android development, there has been a gradual move by android app industry in the direction to adopt Kotlin Programming Language. Pinterest - one of the popular photo-sharing social app, stand first in the queue to use the Kotlin leaving behind Java. At Droidcon NYC 2016, they revealed their interest and benefits, towards the Kotlin shift. This app holds a position among the successful on-demand ride-sharing mobile application and uses the Kotlin language to conduct its Internal Trolling processes. Some of the processes comprise Gradle Plugins, Annotation processors etc. Kickstarter powered by Kotlin - is recognized as the world's largest funding platform that caters funds to creative projects for a small scale based projects that includes music, comics, photography, designing etc. It is a great educational company - provide online courses asses to the learners (Conducted by leading universities like Stanford and Yale). They found Kotlin similar to swift ( programing language for iOS development), which is easy to learn to offer better communication and overall efficient development. It is a project management application. The new code is written in Kotlin, although the code conversion in the old codebase is not completely done. The excellent interoperability between the two languages has made easy adoption. This app is structured to achieve task like note-taking, organizing, listing tasks and archiving. 100% material design, the Twitter browser is based on open-source to make the user experience great on Twitter. It is written in Kotlin, however, some of the code is still in Java. This app allows small business to manage their growth. Complete programming is done in Kotlin, resulting in great quality and speed. Kotlin is relatively a modern programming language and greatly used by leading companies to develop Android Apps. Kotlin App Development is preferred by developers as this language ideally supports the open-source projects. This programing language is successfully proven it's worth, emerging as an excellent choice to boost productivity and check bug.